A Spanish couple enjoys an evening of drinks overlooking the ocean. If you desire excitement, meeting people, and nightlife, avoid this island. If relaxation, reading, and sipping on beer tickles your fancy, pencil this place in for your next holiday. 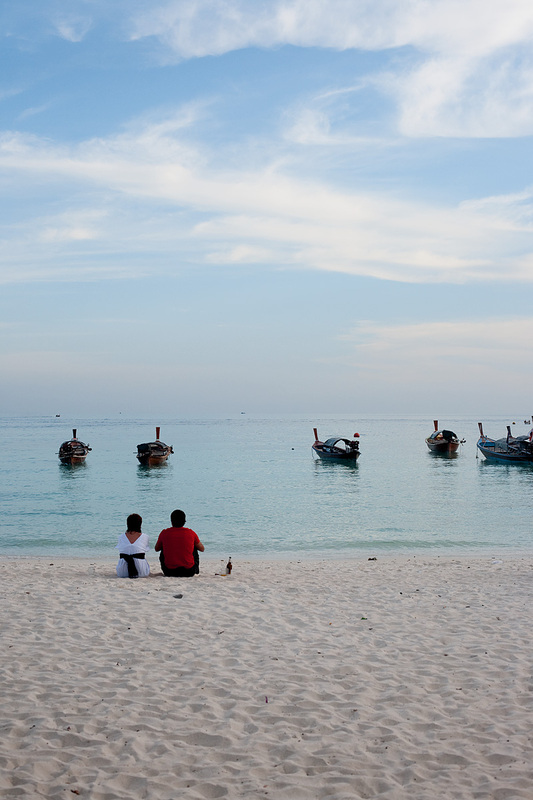 In recent years, Lipe's visitors have slowly morphed from backpacking budget-travelers to luggage-rolling, 2-week vacationers... and mostly couples at that! I suppose it was inevitable once the expensive hotels discovered this paradise and dug their claws into the fine white sand. It'd be unreasonable of me to believe this island would remain a secret forever. Regardless, I'm still enjoying myself in the crystal clear sea and perfect 85ºF (25ºC) weather despite the lack of random social interaction common during my previous visit to Koh Lipe. A Spanish man throws a rock into a calm ocean over a cold Singha beer. Oh pius. If I were with you we could be a couple and co-mingle with other couples. It would be just like the old days.